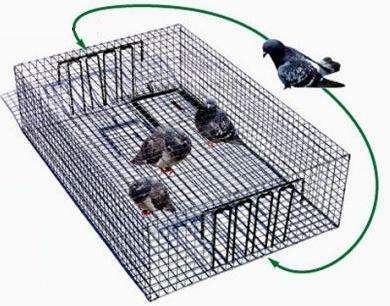 Home :: Bird Traps :: Pigeon Trap 10" x 24" x 24"
Automatic repeating trap that will hold up to 10-15 pigeons at one time. Birds are trapped alive and unharmed. It is constructed of 1" x 1" 14 Gauge Galvanized Wire, with a one-way steel rod gate. Trap will last indefinitely. Pre-assembled.